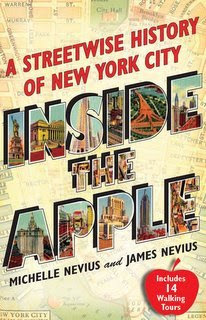 Two weeks from tomorrow Inside the Apple: A Streetwise History of New York City hits stores shelves. We have a number of links on our website to online merchants where you can pre-order the book. But we are also great supporters of local, brick-and-mortar stores and encourage you to pick up a copy of the book from your friendly, neighborhood bookseller. A great place to find an independent bookseller is http://www.indiebound.org/indie-store-finder. If your local store hasn't ordered Inside the Apple, ask them to! The ISBN number is 141658997X. We have a number of events planned, which we will publicize more in the coming weeks. In the meantime, check out http://www.insidetheapple.net/appearances.htm for more information.